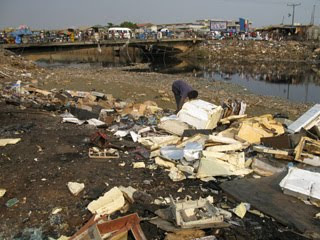 At 2 p.m. we had an appointment with Mike Anane, and he brought us to the e-waste dump site. 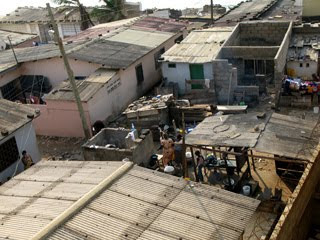 Sodom and Gomorrah is the name of the district, and it used to be the slums out of Accra, with high criminality. But in those times, it had green meadows, and the children were playing soccer there. So did Mike. He goes there 3 times a week to talk to the people, make photographs and video testimonies, and collect waste with foreign labels. Mike looked a little bit like us, walking through the trash, collecting here and there. 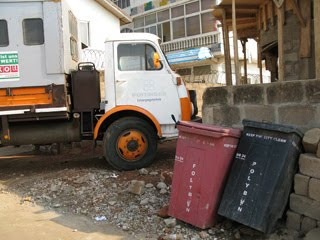 Some of the electronic waste comes directly from the port – they check, if the devices work, and then bring them to this place. Other items go to small shops, the owners buy them and then find out, that they don´t work. They put them out on the street then, where people with carts come to collect and bring to this dump site. 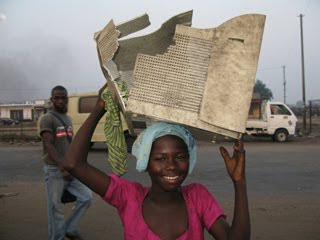 Here mostly children are working: they smash the devices and melt out the copper and lead. 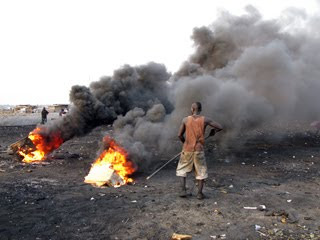 The smoke is extremely poisonous, lead makes people aggressive, thus causing fights. Many people there have serious scars everywhere. 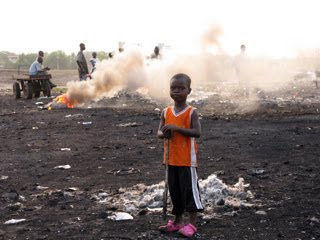 Most of all, the smoke causes cancer, and this children die early. They have diseases all the time. They mostly have single mothers, who don´t know how to buy enough food to feed them, or buy school books. Most of them go to school in the morning, and work on the dump site all afternoon. The smoke is also bad for the brain, and most of them have very small bodies for their age, while their faces look older than they are. 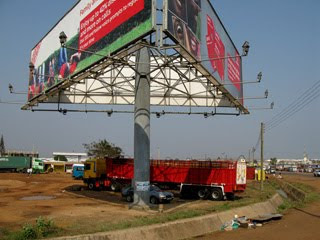 Children from all around come to Accra to work on this site, even from the neighbour countries, like Togo. Girls work there to sell food or water, which is also used for cooling the metals. We collected some dividends for our lucky shareholders, and the girls helping me to carry got some coins at the end – about 50 cents each, which is half of the daily income of the workers here. 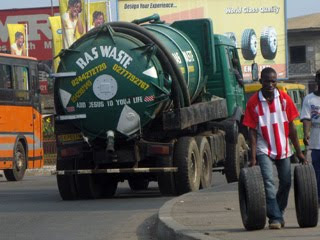 On the way to the dump site, we noticed a green truck with the letters “RAS WASTE”, and “ADD JESUS TO YOUR LIFE”: the local disposal company of liquid manure. They empty their tanks directly into the sea, unfiltered. Mike told us, that he also was fighting against this practise, and that a new law against this is about to come. When we came back, Manuel had 39,4 degrees fever, and we had to bring him to the hospital. “Mama” explained the driver where to go, and after about 2 km of driving, the taxi driver asked us, if we knew where to go. Then he continued driving. We stopped him, he asked other drivers, they showed in one direction and our driver went to another direction. 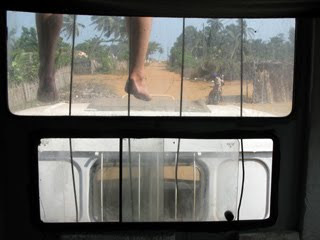 We insisted to leave the taxi and asked people – there was a hospital around the corner, and we walked there. Manuel had to spend the night in the hospital – Malaria. Browsing for a reasonably priced place, I found the description of the way to the cheap hostel we were looking for the other day. It took us more than an hour to find it, at the end a woman brought us there. Crystal Hostel is very well hidden, no signs, nothing. Quiet place with a big mango tree in the middle of the yard, we finally felt at home and safe. Manuel went to bed immediately, we called Mike Anane, a local journalist and activist, whose contact we got from the Austrian NGO “Südwind”: they made a documentation about a huge electro-waste site in Accra, where all the broken computers and electronic devices from Europe and the USA are disposed. 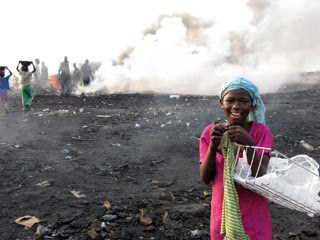 About 80% of the second hand electronic devices sent to Ghana are completely useless, they end up at this dump site, where mostly children work to put out useful parts. 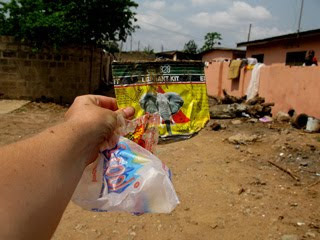 We told other guests about our project, and Julia, a Swedish woman, who builds a lodge on the country side in Ghana together with her boy friend, showed us a purse made out of woven plastic bags. There are some small NGOs on the countryside, who make different items out of waste. In the morning Manuel felt really sick. After getting the final stamp, we passed the border and he lay down sleeping. The street to Accra was running through countless small villages, and it took us almost the whole day. 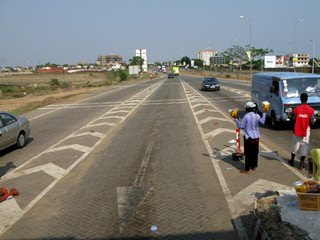 Accra is a fast growing city with about 2 million inhabitants. It looks like an American or European metropolis in its center: huge, modern architecture, theatres, parks. Everything looks nice and clean, almost no trash. We asked a taxi driver to guide us to a hostel we found in the “Lonely Planet”, but the taxi driver did not know it and brought us to another place, but it was dirty and humid. Manuel had fever and refused. At the internet café nearby we found a hostel run by the Methodist Church nearby. A taxi driver brought us there, but there was loud gospel music and we were supposed to put the truck out of the yard at 6 o´clock in the morning, because next day was Sunday. We decided to eat first, then started to look for a place again. At a restaurant on the beach we asked an American tourist for reasonably priced accommodation, and he sent us to a “Rasta”-place. Manuel started hallucinating. The “Rasta”-place was a posh tourist resort, somebody sent us further along the beach. At the end we found an expensive, posh Chinese hotel in the middle of the Favelas. Manuel got a room with air condition and felt better immediately. We spent the evening talking to the people around. 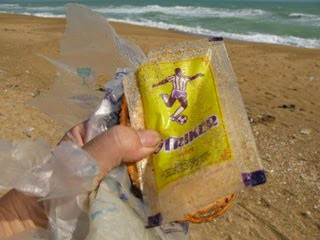 The sea we saw so far was all littered with these low-quality black plastic bags, which break at first use. I decided to start collecting this bags. We got our visa immediately, and headed for the border. 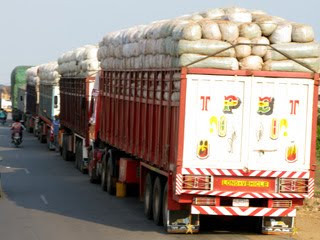 There we were told, that we needed a carnet, otherwise we had to pay the value of the truck as a guarantee, that we would not sell it in Ghana. They were talking about Eur 2.000,-, which we did not have. Next round: from officer to officer, finding out, that it was also possible by making a bond. There were insurance companies doing this, and they charged Eur 100,- - still too much for our tight budget. Back to the first officer, asking if there are cheaper options. He sent us over the border to Ghana, there was a row of offices. We walked over the border like many other people, without even showing our passports. On the other side, we found an office where they offered us to write a letter, telling that we are tourists and politely ask to enter the country with our truck and promise to bring the truck out of the country again. This sounded ridiculous, but we thought: ok, this is Africa – who knows. The man wrote the letter by hand on a paper, I typed it into the computer, and then we went to an official decorated with 4 stars, who signed and stamped the letter. Then back to the other officer, who asked: “But where is the bond?” So back to the beginning: what is a bond, what does it have to look like? Over the border again, back to the office. They asked us to wait. 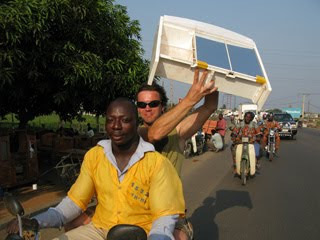 Then back to Togo, we went to the 4-star officer and asked what we could do and why it did not work. He made a phone call and sent us back to the first place. In the late afternoon, the officer there brought us a man from an insurance company, which would charge a correct price. Back to Ghana, filling in forms, and then: Eur 50,-. With the guy back the officer, we asked, why it was so expensive. The officer started to shout at the insurance guy and told him, that it was Eur 25,- - an amount we were happy to accept. Then back to the waiting room, the man were running around with forms, and about 1 hour later it was – almost – done: They phoned a man who was at home already back to the office, he signed and stamped, and then it turned out, that a signature of the chief officer was necessary, and he was gone already. It was dark, and we had to spend the night between the borders. The guard told us to please move the truck to another parking place, because at night there might be some shadows of people jumping over the walls, and then he has to shoot. 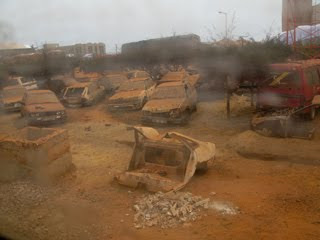 The parking lot was filled with rusted cars, which were confiscated because of fake number plates. The area between the borders was an interesting place: usually, these places were already indicated from far by lots of trash. Here it was the opposite: dustbins everywhere, and posters with “Keep your environment clean”. I threw a banana peel on the ground, and immediately somebody came and showed me the dustbin. I only found a few water sachets, and one big fence with black plastic bags all over. Taking photos was not allowed, and we did not render for more trouble. Going to the embassy early, lots of people. 4 passport photos obligatory, we went out to make photos. After some hours waiting and filling out forms, we were told to come back the next day. Some German guy we met there explained us how to get to a nice place to stay, run by a Swiss lady: “Chez Alice”. 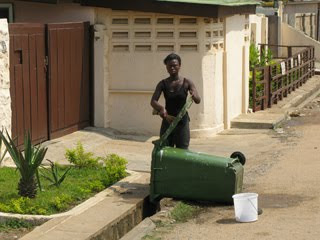 It was close to the beach, a little bit out of Lomé: clean, beautiful and cheap, with brilliant internet connection. They serve Swiss food (“Rösti”), also vegetarian stuff, and they have their home-made ice tea out of a local plant. Lots of dogs around, playing; cats, some monkeys; old style African furniture, masks on the wall. Gert Chesi, the famous Austrian photographer and director of the "Haus der Völker" in Schwaz, Tyrol, usually stays there, Alice showed us his books. We enjoyed the first newspapers since long, good food and friendly atmosphere. 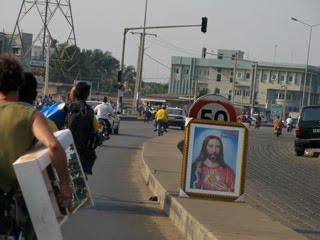 Igor explored Lomé, I felt sick and went to bed early. 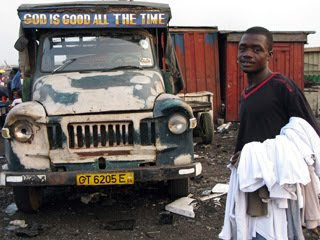 Our travelling guide says, that you can take a bus from Cotonou to Accra, and arrive the same day. We packed our truck and started around noon. 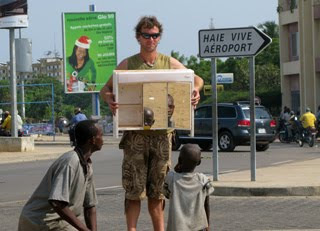 Before crossing the border to Togo, Manuel wanted to visit a friend, who has a lodge on the seaside. His wife told us, that he was arrested, because he had borrowed his car to a relative who commited a crime, and they found him as the owner of the car. We collected some dividends for our shareholders on the beach and back on the road. 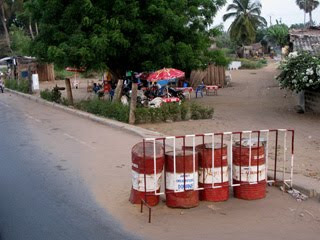 The border to Togo was easy, we got our visa immediately, and wanted to spend the night around Lomé (capital of Togo). Looking for a good place to stay, we suddenly were on the border to Ghana. The sun went down, and the border was really busy: people packed with lots of stuff, discussing, shouting, negociating. We went out to get visa – inshallah -, but were sent back: no more visa at the border, we had to apply at the embassy in Lomé. Back to Togo, we had the departure-stamp in our passports already. It was dark, and still no place to stay. Hungry we went into a Chinese restaurant to eat, and asked if we could sleep next to their entrance and guardian, so we were protected for the night. 11. 1. 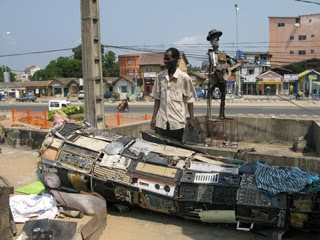 Cotonou Trash Art and "Alibert Voodoo"
Maryam and Joachim had to leave for Lagos. 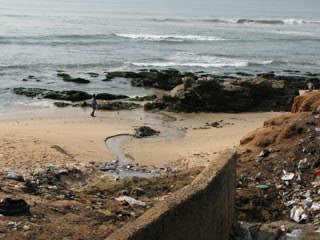 The rest of us finally wanted to leave Cotonou for Ghana. Before this, we decided to apply for visa for Nigeria, as we all have flights out of Lagos, and the officer at the Nigerian embassy in Cotonou gave Maryam and Joachim visa without asking for bribes (which really surprised them after their border experience). Arriving at the embassy, they were out of application forms and asked us to go and make copies, but some more for their further use. 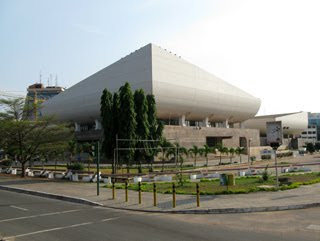 Then we had an interview to prove, that we “deserve to go to that wonderful country”: Why we wanted to go there, what we think about Nigeria, what we know about it? And then the officer said, we better go back to Vienna to apply, here it is no business for him to treat our asses. We did not have money for bribes, so he only “could give” us visa for 7 days (in the form it said 1 month), which was ok with us anyway. After this performance, Igor, Stefan and I went to ASTON, an artist living at the beginning of Haye Vive, the posh restaurant and boutique-area of Cotonou. 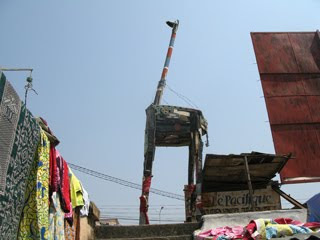 We had passed the house several times, admiring the huge trash metal giraffe and guitar player on the roof. His phone number was written on the wall next to his door, so we had made an appointment with him for 2 p.m.
Aston was there, and he introduced us to his universe of finest trash: all walls, and even the ceiling were covered with artworks and installations. Out of a big box, he conjured up one installation after the other, like the “politichiens” - politicians are like “chiens” (dogs), when they get their food, they don´t let anybody else to their bowl. 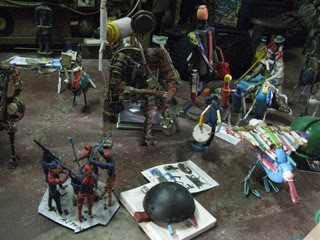 His roof top terrace is covered with assorted trash, most of the work he is doing there. If he specialises in certain kinds of waste? “No, I am collecting everything”. We fell in love with some of his works and bought them for the exhibition. 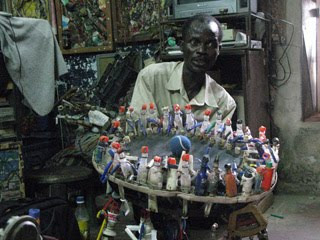 After a short meal, we called the trash artists we met at the voodoo festival in Ouidah. They told the zemidjan-driver how to get to their place. With our rich booty from Aston in our hands, and the “Alibert” (small mirrored bathroom cabinet) our colleague Markus Wilfling gave us for our truck´s “bathroom”, we were sitting on the mopeds and went high speed out of the city to the suburbs. Markus is collecting “Aliberts” and uses them for his artwork. He bought us one, and we had to promise to stage a “voodoo”-ceremony with it. The artists with their voodoo masks were the right address to do this. They picked us up on the main street and brought us to their house. On the way, they had a huge trash sculpture in the public space. We got a warm welcome, some “Sodabi” (local spirits), and I was dizzy immediately. After explaining our “Alibert”-project, they brought their masks and candles, Igor brought the stag´s antlers, that our colleagues Markus and Max Gansberger gave us as talisman in order to find a good new place for it. After arranging masks, candles, and the “Jägermeister” (an Austrian spirit with antlers on the label), they started to play drums, and we joined them, drumming on different objects and chanting. All around in the neighbourhood people were singing, drumming, laughing, we started to dance, and Igor made the photos promised to Markus. The artists explained their masks, and we chose to buy one containing a water bottle: it was made out of materials from a burned house, the water bottle means something like “drink out of the bottle and be ready to die”. It comes from the time of slavery – when it became too much for the slaves, they were “drinking out of the bottle”, and it gave them incredible strengths. Before leaving, they made a protection ritual for us in their “Mami Wata” house shrine. Our travels will be safe.